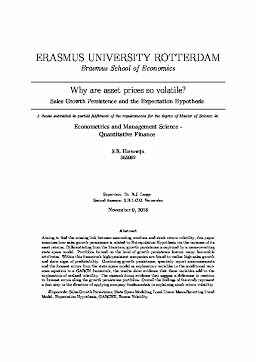 Erasmus University Thesis Repository: Why are asset prices so volatile? Why are asset prices so volatile? Aiming to find the missing link between accounting numbers and stock return volatility, this paper examines how sales growth persistence is related to Extrapolation Hypothesis via the variance of its asset returns. Differentiating from the literature, growth persistence is captured by a mean-reverting state space model. Portfolios formed on the level of growth persistence feature many favourable attributes. Within this framework high-persistent companies are found to realise high sales growth and show signs of predictability. Combining growth persistence, quarterly report announcements and the forecast errors from the state space model as explanatory variables in the conditional variance equation in a GARCH framework, the results show evidence that these variables add to the explanation of realised volatility. The research forms evidence that suggest a difference in reaction to forecast errors along the growth persistence portfolios. Overall the findings of the study represent a first step in the direction of applying company fundamentals in explaining stock return volatility. Keywords Keywords: Sales Growth Persistence, State Space Modeling, Local Linear Mean-Reverting Trend Model, Expectation Hypothesis, GARCHX, Excess Volatility.